Kathryn can attest to my dad-crushes. Call me cliched or naive or a sucker, I don't care, but any time (ok, every time) I see an adoring dad with a little kid, I go a little weak. Taken deeper, this says something about a) family roles, b) gender roles, and c) my relationship with my own father, but let's keep it light for now. On the 13 hour flight from Rome to LAX, I sat one row over from a cute pair of boys (one 2 years old, one in his 30s). Not everyone will agree with me, but kids on planes are better than most in-flight entertainment. I understand the wailing or incessant seat-kicking can be aggravating, but I try to be the person on the plane who will smile understandingly, even sympathetically, when it happens. I was a kid on a plane once, too. Mostly I just love to be around the spirit and energy of kids, and on the inside I am also wailing and kicking my feet too. With dark brown eyes and choppy blond-brown bangs (his haircut was skater-boy-gets-a-mullet), this kid was cuuuute. He vroomed his miniature toy skateboard on the food tray -- when he wasn't perched on it, smiling proudly. His legs, olive brown and bare in cargo shorts, squirmed and kicked, or simply curled under him as he re-arranged magnets in his activity book. His dad wore the forest green airline blanket around his head like the Virgin Mary while his son snuggled into his white t-shirt for a nap. Occasionally, he growled, energy busting through seat belts and circulated air flow, then wailed, his eyes red and salty. By the end of the flight, we were buddies. Playing peek-a-boo, systematically stacking airline cups, he told me what he saw out the window. We spoke in broken Italian, our language skills even. "Papay," he touched his dad's hip but his eyes were on me, "Papay." "Mmmhm," I smiled. "Papay." That's your dad. Patient and quiet, with dark eyes and hair, he held something back. But he was so sweet and strong with his son, his love fierce and tender all at once. As we exited the plane, the 2-year-old in his dad's strong arms, he smiled at me: "Ciao ciao! Ciao ciao!" "Ciao ciao!" I sang to him with a small wave, and his dad smiled at us and wished me a good trip. The birds are singing through the citrus trees outside, and the clouds are those delicate little wisps stretching out on top of the mountains. I am grateful this is one of my alleged homes, the mountains grounding and the trees full of promise, sweet blossoms bringing fruit. 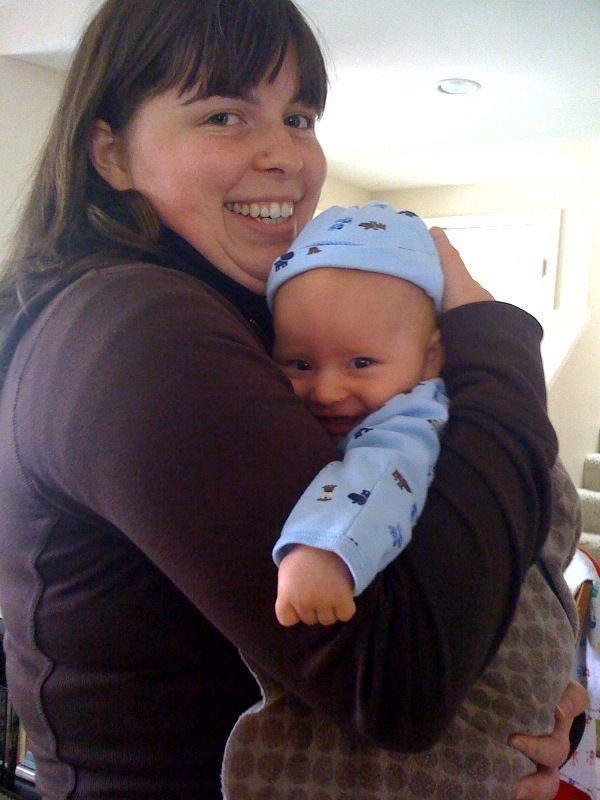 It took Charlie approximately 5 minutes to warm back up to me, this baby I held and giggled with for so many months. He walks now, making animal noises (most indiscernible), and I am surprised by how much has changed, and how much is the same. I guess this is the same sentiment for how I feel about "being back" . . . how much has changed, how much is the same. Isn't air travel amazing? Not the food, or the lack of leg room, or the fact that announcements in airports are always, always, always fuzzy and garbled. The more important they are, the less coherent. But in hours you can be in another time zone, the songs of another language dancing in the air, different characters on signs. It blows my mind. Gone are the days of cargo ships and covered wagons. In hours we are transported to another culture, but the hitch is that yes, our bodies are there, but everything else can take awhile to catch up. And yet, it's scarily easy to plug back in to the role you were in before, perhaps a role you were desperate to leave. So here I am in the States, but just like last time, I am not 100% here yet. It's a slow process, coming home, but my mind keeps trying to rush it. What will I do next? is a favorite question and I haven't even been home for more than 48 hours. Upon our descent into LAX, I felt the waves of nausea. Houses and swimming pools, streets with cars (how many cars with only one driver? ), four-lane freeways. I was landing, back into suburbia and capitalism and consumerism. Little Boxes (or, this is an awesome cover/music video by Walk off the Earth) came into my head and stayed there. Where do I fit in this crazy world, which is go-go-go, which is concrete boxes and checkboxes on lists, which is big box stores and big ambitions? There is value in carving out a life for yourself, making a home, and all of that, but I am worried the carving is going to give me carpal tunnel. Is it possible to carve deep enough into this concrete world to hit earth? I want the soft dirt and hard rocks, the red river rocks; I want the rush of river and sunshine on my shoulders. I want to live simply and aligned with my values. I don't want to take on outside anxieties or judgments. I don't know how all of this is possible. Something about living in the U.S., about just being in the U.S., makes me feel that everything is less possible. The gleam flickers to a fade, my vision is less expansive, my breaths shorter. But this is my challenge, facing these fears, living these questions. Being more than the roles, living in an expansive space, transcending boxes and boundaries. Going quiet enough to listen to the rhythm of my heart, which is always guiding me. Remembering to be grateful for all that I am experiencing in this moment; remembering that this moment, if I live fully in it, will carry me through to the next. Here is to the next moment.